Breast cancer, in humans as in mice and rats, is thought to be the result of sequential changes in the epithelial cells of the mammary gland (1–3). In mice, the intermediate stages are well-defined and their biological properties extensively studied (2, 4). These intermediate stages are visualized as ductal or alveolar hyperplasias, both of which contain cells with an enhanced probability for tumor formation (2, 4, 5). These cell populations, termed preneoplasias, have a common set of biological properties. The essential properties are considered to be the following: 1) immortality, 2) morphological hyperplasia, and 3) enhanced tumorigenicity. The most frequently studied, the alveolar hyperplasias, can be induced by mouse mammary tumor virus (MMTV) (2), chemical carcinogens (2), hormones (2), or spontaneously, as a result of cell culture (6). Alveolar hyperplasias can be transplanted into the cleared fat pads of syngeneic mice, resulting in stable hyperplastic outgrowth lines (1,4). Regardless of the etiology of the alveolar hyperplastic outgrowth lines, the essential biological properties are similar for the different lines. The outgrowth lines are essentially clonal derivatives of the primary hyperplastic alveolar nodules, as was demonstrated by examination of MMTV integration sites (7). 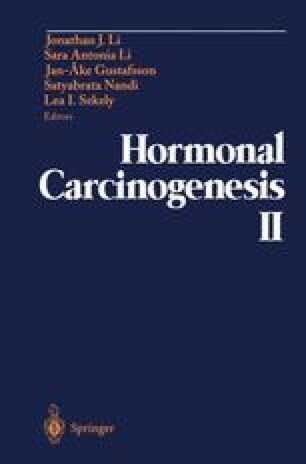 Although some of the critical molecular changes associated with MMTV-induced and chemical carcinogen-induced tumorigenesis have been defined in terms of wnt gene (8) and ras gene activation (9), respectively; these molecular events do not explain the biological properties associated with most mammary alveolar hyperplasias, particularly those induced in the absence of these oncogenic agents. Recently, we have examined a new series of transformed mouse mammary cells for which the biological properties of immortality, hyperplasia and tumorigenicity are independently assortable. The in-situ outgrowth lines and their in-vitro cell line counterparts provide a means to examine the molecular events associated with each of the essential changes acquired during the evolution to the tumor phenotype (6, 10, 11).